10 tips on keeping up with your yoga practice while traveling! how to stay centered and balanced during your travels. 1. Don’t be shy, allow your inner yogi to shine! It is liberating to practice yoga in public places! I practice yoga and do public displays of meditation in the airport all of the time. If you have a long layover or want to prepare for a lengthy flight, do some sun salutations and warrior poses in the airport. If you do not want to be on the floor, try a standing series of tree and dancers pose to balance your hips. Breathing exercises are a great way to prepare for a flight. I love breath of fire, equal inhalations and exhalations through the nose as you gently pump your navel. 2. During your time in planes, trains and automobiles don’t forget to bring your yoga playlist on your ipod or iphone! I love creating a soundtrack for my journeys! Calming music reminds me to breathe slowly and deeply. If you find that the recycled air in the plane bothers you, try bringing a scarf and put a few drops of your favorite essential oil on it, lavender is very relaxing. It is easy to feel off balance when you are in motion towards a destination; it helps to ground your energy. You can ground anytime, anywhere, simply breathe and imagine that a tail is growing from the base of your spine into the center of the earth, spiraling down deeper and deeper. This will clear your energy and keep you in a calm yogic state of mind. 5. Try restorative yoga to help you relax before bed. It can be hard to sleep in different beds and surroundings when traveling, especially the first night you arrive somewhere new. A try few restorative poses such as: knees-to-chest, legs-up-the-wall, simple cross-legged seated pose and supported seated forward bend. Take time for a restorative night practice so you can sleep better and wake up fresh and ready for the day. 6. Bring your yoga mat with you! If you plan to spend the day outside and weather is nice, bring your yoga mat along for the adventure. Find a park where you can relax and read, once you are ready to start your yoga practice you are already sitting on your mat. There is nothing like practicing yoga surrounded by beautiful nature. 8. Did you forget your yoga mat? If so practice yoga in bed! Bed Yoga! This is great for those who are backpacking, since there is not always space to bust out your yoga mat in hostels. Bring one knee up towards your chest at a time to balance out your hips. Seated variation of cat cow, sufi grind, child’s pose are great ways to release hips and back tension from all the walking during site seeing. You can also relax in savansana while listening to guided mediation and allow all tension to melt away. 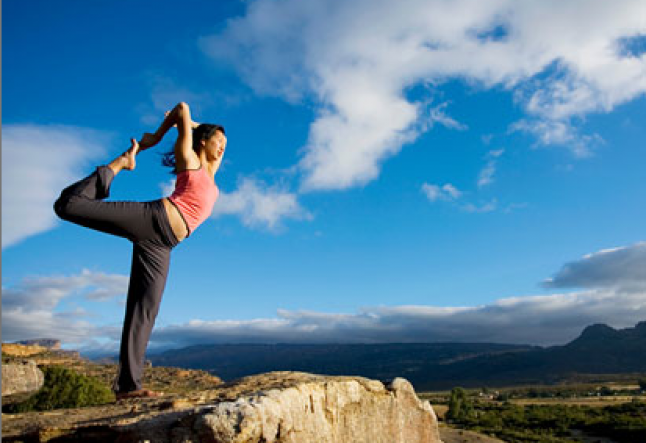 9.Use the genius invention called Google to find a yoga class or festival during your travels! Going to class and learning from a new teacher can inspire you to keep up with your own practice. If you do not speak the language of the country you are visiting, this is a great way to get a linguistic lesson during your yoga practice. Try something new and brush up on your foreign yogi lingo! 10. Seva is the yoga of selfless service. The best experiences in my life have been teaching yoga in to homeless children while traveling. You do not have to teach yoga you can just go donate your time and loving energy. Whether is it with children, nature or animals it is a truly a blessed experience to be of service. It is in the giving that you actually receive. Research where you can go help in the city you are visiting. Take your yoga practice off the mat and do something good, even if you just smile at a stranger and tell them they are beautiful.